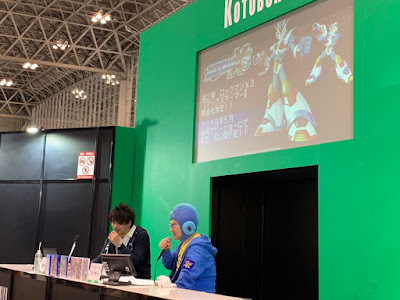 Vanilla X won't be the only Rockman X series model kit coming from Kotobukiya this year. During a special stage show at Wonder Fest, the company confirmed plans to release a follow-up model kit based on Rockman X3's "Max Armor" (aka "Third Armor"). The Max Armor kit will officially be revealed in May at the Shizuoka Hobby Show. Believe it or not, this is the first model kit based on the Max Armor made in 23-years. Bandai released two variations of the armor back in 1996: The white "Max Armor" and the golden "Hyper Special". Kotobkiya's rendition will naturally be far more articulated, detailed, and larger than Bandai's kit. It's definitely something to look out for. Ah, three different X toys. This is fantastic! Now give me a poseable Sigma and we're golden. Yeah, unfortunately you're probably right. A reprint of the SHFiguarts Vile would be nice, if nothing else. Was really hoping the figure would have been a hint to a future X game like rolls redesign figure for MM11. 25th Anniversary for X is kind of a bust right now to me cause both these figures were both done before and now back again. albeit that the Falcon armor looks great though. We better get a gaudy gold version as well. Though I suppose one could just slap on some extra layers of paint as well. Come on, Gold Hyper Special!!! Definitely interested in this one too! Holy crap, YES! One of my favorite armors, I hope they also do a model kit of the x2 armor in the future. Also Protodude, you forgot about the silver plated Max Armor model kit that Bandai released in the late 90s and later again in the early 2000's. My sentiments exactly. Love the X2 and X3 armor designs. Kind of fitting this figure would come back again as a model kit. D-arts or better yet, SH Figuarts Remix (which seems to be a sort of revival of the D-Arts line with updates at least from what I've seen from the upcoming Mewtwo) of the X line with some new characters would be fantastic. Exactly 4 for this one. white max, silver hyper, silver max, and gold hyper. You have good taste ArkaneEvangale, the X2 and X3 armor designs are very underrated. I hope we also get a X1 and X3 Zero and some of the side mavericks like Vile mk II, Sigma, Bit, Byte, the X Hunters. Think of the cool possibilities for display. Wow. Not often you see merch based on X3... or anything at all, really. Please, Kotobukia, A 4th armor, please!! !